Think the sailing lifestyle is beyond your means? Whether you look to buy a boat or just want to get immersed in the culture, we show you how to hit the water without getting soaked in expenses. The wind in your teeth, the snap of the mainsail, the magic and romance of carving the waves in a yar little sloop … will be forever out of reach. That’s right, you can’t afford it. And the sooner you come to terms with the fact that sails and salarymen don’t mix, the happier you’ll be. So, at any rate, goes conventional wisdom. But then, conventional wisdom is seldom the entire story. Yes, sailboats can be prohibitively expensive. However, they don’t have to be. Initiation into elite yacht clubs can run into the tens of thousands of dollars, whereas membership at other boating clubs can be had for as little as a couple of hundred dollars a year. There are, in short, sailboats and sailing clubs for virtually every income bracket. Even if you have no intention of ever owning your own boat, a yacht club membership can still offer great benefits at a surprisingly affordable price. Here, then, are a few tips and tricks that will get you out on the water—and into the yacht club—without breaking the bank. Few people wake up one day, decide they want to get into sailing, and drop a bundle on a boat. That’s a good thing, says Ottawa-based graphic artist and long-time sailor Scott Sigurdson, who for years raced his own Dragon Class keelboat out of the Britannia Yacht Club. In fact, with a membership, you may never need your own boat at all. When technology consultant Mike Rutherford first joined Toronto’s Ashbridge’s Bay Yacht Club he did so primarily to keep in touch with a former work colleague who wanted Rutherford to race with him on his boat from time to time. Since then Rutherford has discovered he can immerse himself in the yachting lifestyle as much as he likes, without ever having to spend time or money on a boat of his own. Determining which club is right for you will, of course, boil down to budget—and there’s no limit to what you can spend. Take Merek Baker, project manager with a Vancouver tech company. He moors his 24-foot Beneteau at the Royal Vancouver Yacht Club, where initiation costs a healthy $40,000 plus some additional annual fees. Rutherford and his partner Nicole Worsley, on the other hand, have much simpler needs. They’re content with the more modest—and modestly priced—facilities afforded by the Ashbridge’s Bay club. Worsley, who owns a small one-person dinghy, pays just $650 a year for her membership, while Rutherford pays a mere $400 for his associate membership. Ah, but the day may well come when you’re ready to buy a boat of your own. Which model you choose is going to depend on a number of factors: your budget, what kind of sailing you’re planning to do, and how many people you’ll want to take with you when you set sail. The least expensive boats, not surprisingly, are the smallest: the so-called dinghies, boats up to 16 feet that are usually sailed solo or with one other person. These use centreboards or daggerboards in place of weighted keels, allowing them to be lifted in and out of the water easily. Even here, though, prices can vary wildly: a new high-performance racing dinghy tricked out with the latest in space age materials and sail designs can run you up to $20,000 or $30,000. Keelboats up to 24 feet or so that can be used for day sailing or overnight trips will run you upwards of $150,000. Finally, there are the true sailing yachts or cruisers, boats that can be taken on extended trips of weeks, months or even years. Here the prices can become truly stratospheric: a new 59-foot Beneteau will run you closer to $900,000. If you can afford a new boat of the size and make you want, by all means buy it: it’s as easy as going online, finding the manufacturer, and placing an order. But because boats have a much longer lifespan than cars—30 or 40 years is not unusual—the extensive used boat market usually offers better value for money. For instance, a used Laser—the world’s most popular sailboat—can be had for under $2,000. Larger keelboats can also be found for reasonable prices, provided you don’t mind going back a few years. Merek Baker paid a mere $14,500 for his 23.5-foot Beneteau, but the boat was originally built in 1987. For those looking to go even bigger, a 12-year-old Beneteau in the 46-foot range will cost you $200,000. The surveyor will look and identify other potential problems too, like loose keels or structural weaknesses—provided, of course, that he’s working for you and not the seller. That’s about it. The barriers to entry in the sailing world aren’t as high as you might initially imagine. 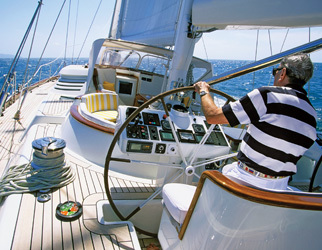 It’s just a matter of making some prudent decisions and finding the boat and yacht club that suit your means—and dreams. Dry-dock dilemmas: Most people purchase a boat, then start looking for a place to put it. You should always do it the other way around—particularly in large cities like Toronto or Vancouver, where space is limited. Put your name on a waiting list well in advance of buying. Protect your investment: Hulls of keelboats that are in the water all season have to be repainted yearly with a non-fouling paint, and wood surfaces should be periodically sanded and varnished. Since sails cost thousands of dollars, have them repaired or re-cut to make them last longer. Living large: Big boats come with a raft of supersized expenses. For starters, moorage fees sharply increase for vessels over 22 feet—expect monthly charges of $500. Soaring equipment costs could also knock the wind out of your wallet—upsizing a boat by 20% increases the cost of sails 50% to 100%.